STOCKO is a company with a tradition going back for more than one hundred years. The foundation stone was laid by Alfred Aders, Heinrich Pfeiffer, and Johann August Stock 1901 at Wuppertal under the name of Stock & Co. - as button manufacturers. Amongst other items, they produced hollow rivets, eyelets, and press fasteners that, during the Wilhelmian boom era, were in great demand andwere even shipped to South America. When Stock & Co. developed the eyelet tag from a shoe eyelet with a solder tag added, the future direction of the company’s activities was set: electrical technologies. Very soon there followed additional pressed, drawn, and seamed metal parts all of which could be manufactured with the same machines as the button parts up until now. STOCKO has met the great ruptures and frequent changes of the industry in masterly fashion. Today the company is well prepared to continue with the 100 year old tradition also in the future. During the Weimar period that is during the twenties of the last century, the living habits of the people changed dramatically; modern electrical devices such as the radio, telephone, or even the electric shaver found entry into the households in large scale. The new direction of the company proved to be a particularly lucky move, 500 people were employed 1935; two years later there were already 1000. Now under the sole company name STOCKO. With the new factory at Malmedy in Belgium 1940, the company grew to a concern employing 1800 people. However, the war was not without consequences, and the numbersank down to 300. There followed the years of the so-called “economic miracle”, and STOCKO, too, gained by the new boom. Subsidiaries were founded like in England, France, Switzerland, and overseas. 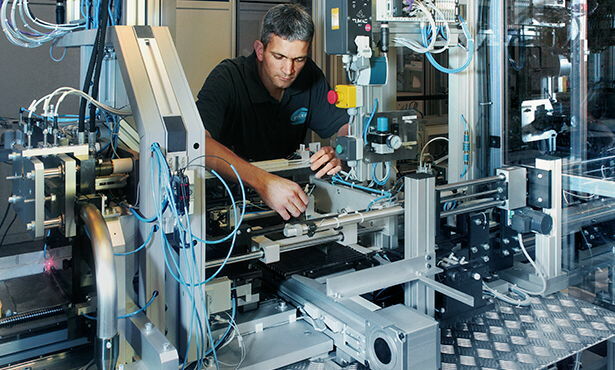 With the expertise, which STOCKO had gained in the manufacture of plastic parts, the product range was extended by film spools, tape cassettes, slide frames etc.. During these years, the expansions abroad continued steadily until far-reaching re-structuring measures took place during the nineties. In 1994, STOCKO divorced themselves from the division Fasteners. In 1998 a merger with the Bamberg Wieland Group took place and since then the company’s name is STOCKO Contact GmbH. & Co. KG. Today STOCKO employ about 600 people at three locations: Sales and Marketing are at Wuppertal, production is distributed among the plants at Hellenthal (Germany) and Andlau /France. Alfred Aders, Heinrich Pfeiffer and Johann August Stock are setting up the company Stock & Co. (abbreviated later to STOCKO) at Wuppertal. The first products are metal goods like hollow rivets, eyelets and press fasteners for sport belts with leather pouch that were exported into the Far East, South America and Africa. Four to five workers were the original core work force. August Stock whose name the company was bearing resigned already six months later. Nevertheless the company's name remained unchanged. The subsidiary factory at Hellenthal/Eifel is established. STOCK & Co. are already employing 110 workers at that time. Hugo Henkels, the commercial manager until then, becomes partner and eventually sole owner of Stock & Co.. He expands the 'Button Factory' into a metal manufacturing operation, toolroom extension, investments into efficient production machinery. The name 'STOCKO', already used as brand name for many years, becomes part of the company's name with the founding of STOCKO GmbH. Stock & Co., however, which was meanwhile changed into a limited partnership company, continues to operate but with the addition of "Metal and Celluloid Goods Works". Setting up a production at Leningrad that reaches a work force of more than 1000 employees in later years. In 1932, the Russian government takes it over against payment in full. This successor company still exists in a suburb of St. Petersburg. The proceeds of the sale were invested in the extension of the German plants and in a subsidiary in England that was founded shortly afterwards. At the end of the 1920s, the production of special parts for the electrical and radio industries is developed. A shoe eyelet with a solder tag added becomes an eyelet tag, shortly afterwards there follow other stamped, deep drawn and seamed metal parts for use in the electrical industry that were manufactured with the same machines as the traditional haberdashery items. Kurt Henkels, son of Hugo Henkels, joins the company. STOCKO set up a subsidiary in England. STOCKO employ a workforce of 500. The companies Stock & Co. and STOCKO are brought into a new company of unlimited liability. The new name: STOCKO Metallwarenfabriken Hugo und Kurt Henkels. The name Stock & Co. is discontinued. The company has a workforce of more than 1000 employees at the time and generated a turnover of over 6 million Mark. The subsidiary at Malmedy Is set up. STOCKO establish a subsidiary at Antwerp/Belgium. Part of production is transferred to Frankenstein/Silesia. Production is resumed immediately after the war: STOCKO manufacture amongst other items alarm clocks which were completely made up of pressed parts produced by STOCKO. These clocks were excellent objects of barter for foodstuff used in the works canteen for the benefit of the workforce. The developments during the war years obviously had consequences for the employment figures. The plants at Malmedy, Antwerp, Frankenstein (Silesia) and England were lost at the end of war. Whilst in 1940 STOCKO had more than 1800 workers, in 1945/46 there were only 300 left. The war damages suffered by the German factories were only of limited consequences, and after the Currency Reform in 1948 the company had a speedy recovery. The good relationships abroad were re-established already shortly after the war, a large number of agents of many years were installed again. STOCKO celebrate their 50th Anniversary, now again with more than 1000 employees. STOCKO FRANCE S.A., at Barr/France, is founded. The subsidiary HESTO (Henkels-Stocko) Ltd. is founded at Potters Bar (England). Dr. Dirk Henkels, son of Kurt Henkels, joins the company. At Zurich, the STOCKO Metallwaren AG is founded. Together with a German-Mexican partner STOCKO establish the subsidiary STOCKO Manufacturas Metalicas S.A.. Owing to turbulence in the currency market with the Peso, STOCKO sold the shares of this manufacturing company to this local partner. STOCKO take over the company of their distributor in the USA and set up production there together with the BLACKWOOD-STOCKO Corp.. An express service for small quantity orders is installed at Harscheid (Germany). Relocation of STOCKO-France S.A. from Barr to Andlau. At Malmedy the Belgian subsidiary STOCKOBEL S.P.R.L. is founded. STOCKO celebrate their 75th Anniversary. Founding of STOCKO TUNISIE S.A.R.L. Ez-Zahara in Tunisia. At the same time STOCKO Metallwaren AG at Zurich add the Sale and Marketing of products from the Electro - Electronics Division to their activities. STOCKO employ 94 trainees during this time. The work area at Andlau is extended by 2000 square metres. On 11 November, STOCKO exist for 80 years. The total number of people employed at home and abroad is 1700, every day almost 60 million parts are leaving the various production plants. The "Film-Foto" Division product range which includes already glass-free slide frames, film and audio-tape reels is being extended by the addition of video archive cassettes. Further to the extension in 1984, another 2000 sq. m are added to the work area at Malmedy which has now a total of 4500 square metres. The number of people employed there is now 200. STOCKO is founding a manufacturing company in Singapore that later establish their own subsidiaries in Malaysia and India. STOCKO Corporation, the subsidiary in the USA, move into own new administration and production premises. An new production unit is completed on the Wuppertal site with which the production area is increased by 3700 square metres. The STOCKO-Verschlusstechnik division is taken over by the Japanese group YKK and continues to trade under the new name STOCKO Fasteners GmbH.. Before the company was split, the consolidated turnover of all STOCKO companies together, with a workforce of about 1500, exceeded well over 200 million DM. Production in Tunisia is discontinued. The extension of STOCKOBEL at Malmedy with a total floor area of 7200 sq.m for production, machine building, stores and dispatch as well as administration is completed. 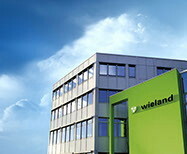 The Wieland Holding GmbH take over STOCKO Metallwarenfabriken, Henkels und Sohn GmbH & Co.. 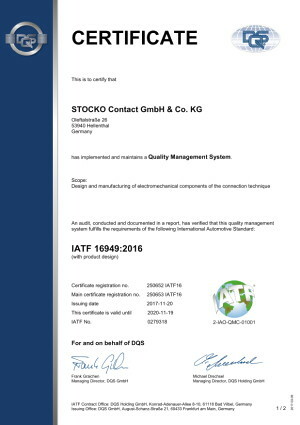 The company continues to trade under the new name STOCKO Contact GmbH & Co. KG. STOCKO France celebrate their 50th anniversary at Andlau. The Malmedy factory, one of four production facilities to date, will be closed in spring 2009 and the production will be relocated to Hellenthal. STOCKO Hellenthal celebrate their 100th anniversary. A high volume of investment in all factories and divisions. 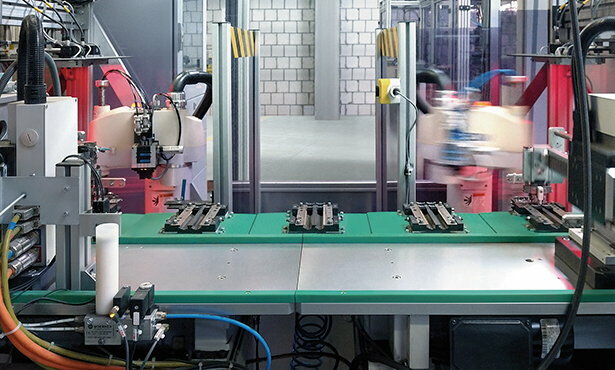 Significant improvement in infrastructure, machinery and large parts of production. Production area extension by 1,000m² in Hellenthal. Construction work in the order of 3,000m² is being completed in Andlau. The Andlau Factory undergoes a continuous optimisation of its manufacturing processes through various restructuring measures. To ensure the further growth of STOCKO France, plots of land with a total area of 20,000m² were purchased in 2016 and a property with a floor area of about 3,500m² situated on that land was completely renovated. STOCKO pursues its growth strategy and makes a further investment at the Hellenthal location to increase the production and administration area by about 3,000m² through a new factory building.